Butano State Park is just about 15 miles south of Half Moon Bay, We'd tried to hike at Butano State Park back in May or June, but were rained out. Today was bright and sunny and a completely different feeling. We got a late start but didn't run into nearly as much traffic as at Muir Woods. In fact, when we got to the park it seemed very quiet. There were other cars in the lot near the entrance, but it's a small lot -- perhaps 10 cars. Jean and I started off on the hike around 1:20pm. We crossed the road and started up the Ano Nuevo Trail. It starts climbing almost immediately, steeply in places. The hike starts out through knee-to-waist level brush. I admit to fiddling with my GPS contraption and not paying too much attention for the first 5-10 minutes. This was the first time I brought it along and I have to admit I was disappointed with the results. It grossly miscalculated the distance, clocking in at about 4.5 miles. I know it was wrong because there were several stints where I would walk for several minutes and it didn't think I'd moved at all (and it was measuring down to 0.01 miles, or about 53 feet). So, I'll have to figure out what the problem is before I bring it along again. Back on the trail, it grows steeper and steeper, with a few wooden steps in some places. After climbing about 400 feet, much of it on very short, steep switchbacks, we reached a small bench where we sat down, rested, and enjoyed the view. We could see through the trees and out to the ocean. The view is partially obstructed but, as I learned on the way back, if you walk up about 20-30 feet and turn around, you'll get a pretty much unobstructed view. Enjoy the break, because the trail just keeps climbing. After another 350-400 feet of climbing, we reached a side trail to another bench. This one, while being at the top, doesn't have nearly as good views, however. The trail levels off somewhat, descending slowly before shortly dropping out of the forest and onto the Olmo Fire Road. We turned right and shortly made a short steep descent and turned left onto the Goat Hill Trail connector. There are a series of trail intersections so you'll have to pay attention here. At this point we weren't actually on Goat Hill Trail itself -- just a connector. Just a minute or two down the trail, though, we ran into a trail intersection. Here, we ran into the first hikers we'd seen all day. They were a little disoriented and asked us where we'd come from. After setting them straight, we turned left onto the Goat Hill Trail proper. At the next intersection we turned left to stay on Goat Hill, rather than take another connector trail back to the Olmo Fire Road. After a short time on the Goat Hill Trail, we turned right onto the Doe Ridge Trail. We shortly stopped at a small clearing underneath a large tree to have lunch. Most of the trail is shaded, running through pleasant forest, but this was one of the few clearings. After lunch we continued along the Doe Ridge Trail. This is my favorite part of the hike, as it passes through one of the nicest redwood groves I've visited in the Bay Area. In fact, some of the redwoods here are some of the largest I've seen, which is surprising considering most of the old growth redwoods in the area were logged long ago. 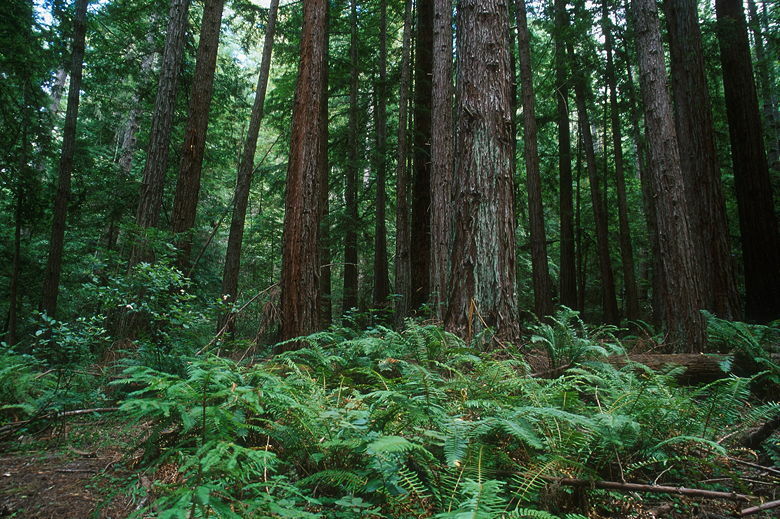 Some of the trees are also much wider than you come to expect from coast redwoods. I took several pictures here as another pair of hikers passed us in the opposite direction. 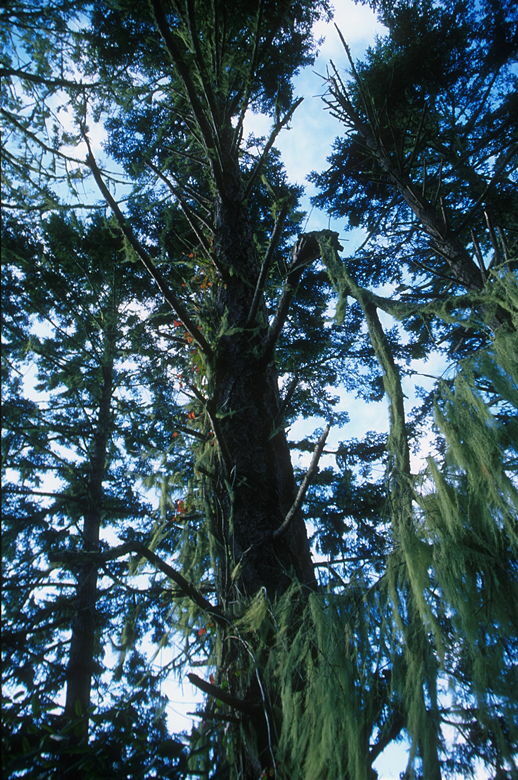 I noticed one particular redwood tree with soft-edged limbs. It has many of these limbs which are visible from the opposite side (you'll see it as you continue along the trail). A rather loud group of 4 hikers was slowly approaching us from behind, so we continued on down the trail. The redwoods continue for some time, but I think the section closest to the Goat Hill Trail side is one of the best areas. I'll probably return in the future for more photography here. I happened to notice one banana slug while taking my pictures, and later another one on the trail. I was a little surprised to see them because the ground was actually very dry (this being mid-September). They usually prefer moister habitats; perhaps that explains why I didn't see very many. We saw many more when we briefly visited the park back in May or June. Most of the Goat Hill and Doe Ridge Trails is relatively flat. Eventually we popped out onto the Olmo Fire Road again, and turned right to head back. The fire road rolls up and down, very steeply in places. 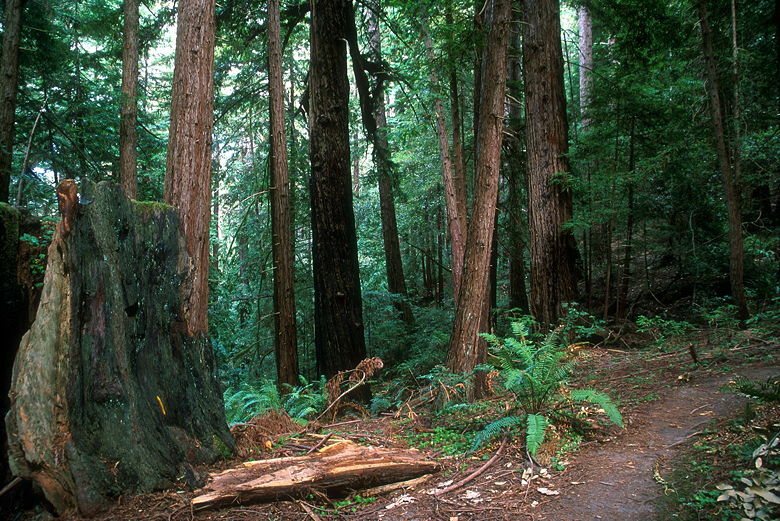 In that regard, it reminds me of the trails in Henry Coe State Park. We shortly passed a sign which said private property (some christmas tree farm), no trespassing, but I think that's for the benefit of vehicles. Looking at a park map, pars of the fire road are actually outside the park boundaries. But it shouldn't be a problem. Just stay on the trail. We saw tire tracks on the fire road, but we didn't see any mountain bikers while we were there. 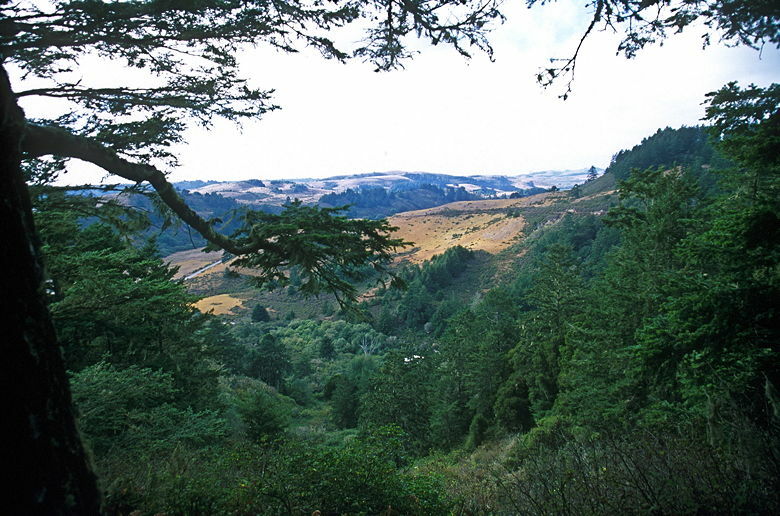 There's nice enough forest on either side of the road, but the real gem of this hike is the redwood forest on the Doe Ridge Trail. That's the real reason to do this hike. Eventually we reached the section of the Olmo Fire Road we'd been on earlier, then turned left and descended the steep Ano Nuevo Trail, back to the parking lot. It was 5:25pm by the time we got back, and the parking lot was empty. There are quite a few other trails in the park which bear exploring, so I'll probably return to this park in the future. There's even a trail camp in the park for those of you interested in backpacking in the Bay Area.